Final weather update is 100% cloud cover and consistent soft rain throughout the day would seem to be reality. 10C with 3.3mm rain at 10h00 and 4m/s NW, 12C with 1.7mm rain at 12h00 5m/s NW, 13C with 1.9mm rain at 14h00 and 4m/s NW, 11C with 1.9mm rain at 16h00 and 4m/s NW, 10C with 2.9mm rain at 18h00 and 3m/s NW. Address is Sir Garnet Hotel in Solomon Street, Wolseley. Route is quite simple on paper - but it may prove quite challenging in reality! It will require concentration and determination to post a good time and - there is the little factor of a little lady and her green Toyota should it turn wet! Just to let everyone calm down - the route will be easy to understand - just count accurately on this one. A lap too much or too little could prove vital to success? Gavin - no need to be there at 05h00 this Saturday. Come prepared for a chilly day as Sunrise will be at 07h40 at 8C and the temperature will average 10C during the day with Sunset at 17h57 at having peaked at 15C. A 30% chance of light rain and this is near the mountain where wind is tested before sending it into the Cape Peninsula. A lovely atmosphere will however be good compensation! 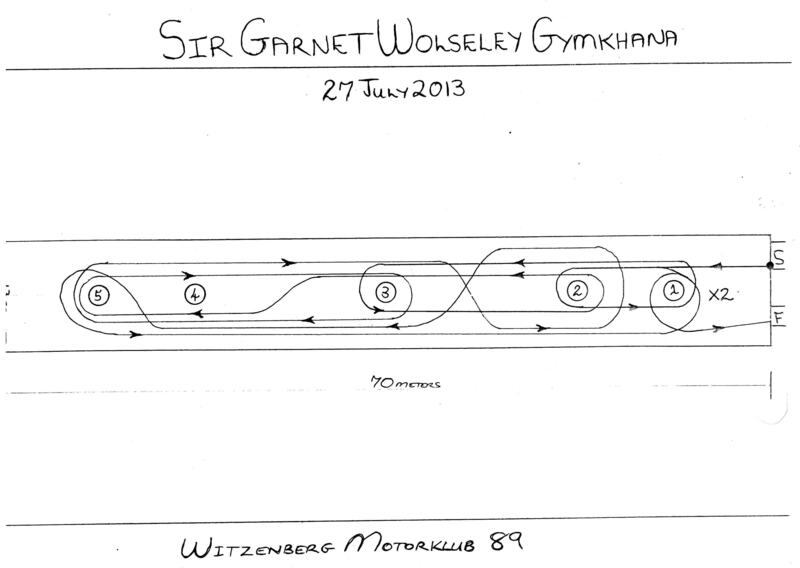 30 October 1999 the Sir Garnet Wolseley Gymkhana prompted the idea of presenting a Gymkhana Series as alternative to the Pop's Robert Interclub Series which started to wane. A small entry started the event at 14h00 on that Saturday and it would seem as though we are once again completing circle as we have at this stage attracted 27 entries. Compared to 1999 this is still a good entry but then we have had 100+ entries during this period. 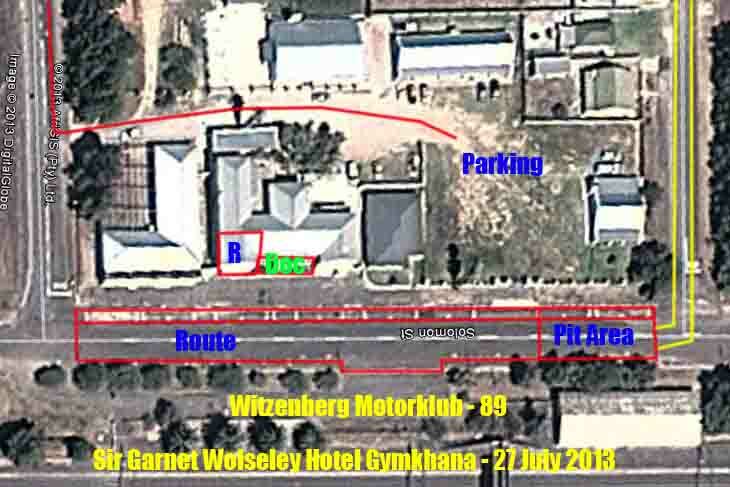 It is not all doom and gloom and it is just the right time to take a step back and set sail in the proper direction as this will be the 89th event under the Witzenberg Motorklub banner. Costs are always a telling factor and the move towards standard have been met with encouraging feedback. To Autozone Ceres (Henry Kennedy), VV4 Vervoer (Dirk and Danie Viljoen), Breede River Truck Centre (Jean-Pierre Robberts), Worcester Digger and Tipper Hire (Kobus Wilson Jnr) and FM Civils (Fanie du Toit) an advance thank you for their support of the Sir Garnett Wolseley Gymkhana 2013. Our sincere gratitude is extended to the Witzenberg Municiplaity and Emergency Services (Hermie Visser), Traffic Services (Daniel Jonkers) and the SAPD (WO Wouter Swiegers) for their support in having this event return to the annual Witzenberg Motorklub Gymkhana Series calender. The Boland town of Wolseley was named after the British Army field marshal Sir Garnett Wolseley (1833-1913) and actually separates the Berg and Breede rivers. The 1930 Sir Garnett Hotel owes it’s name to the same person and was owned by the Katzenellenbogen family (1930-1977) before former mayor, Chris Laubscher, took ownership from 1977. No longer a hotel the rooms are now permanently let but the Restaurant and Pub have remained popular within the local community and various motoring / motorsport events have taken place in front of this historic building. Francois (Appel) and Rosalie Pienaar will be our friendly hosts on Saturday 27 July 2013. Should you require more information please phone 023 231 1361 regarding Toourism in the area. You are invited to camp behind the Hotel at just R10 per person and ablusion facilties will be made available for the duration of the event. Prizegiving will take place at the Restaurant and two resident singing talents, Adele de Wet and Mandie Viljoen, will provide an entertaining closure to proceedings. Overcast weather is predicted with a possible splash of rain so be prepared for cool – damp conditions in the morning and a rather tight route on a tarmac road surface measuring in at 70m by 13m. Parking is Boland style concrete pavements so you would be well advised not to hit them at any time. Those with the longer memories may remember a much younger Neels Rabe – Brian Peek doing commentary from the 1930 balcony or the VV4 Vervoer Gymkhana events just further down the same road. First official entry for the event came from Nashrene Schloss for her always immaculately prepared Toyota Corolla Twin Cam 1800 and this talented lady may well be reason for concern to those frail mail ego’s. Freat news is the return of the Roux brother and sister combination. Marius Roux would approve of Morné Roux and LieselzOosthuizen in their class C Mazda 323 160i and then brother-in-law, Nic Oosthuizen, will be sharing his class A VW Golf MkII 2.0 with wife Liezel whilst Liezel will also be campaigning her own Toyota Yaris 1.3 in the all ladies category with a yet to be announced navigator. Five entries from just one family is what this sport is all about and all in street legal cars. 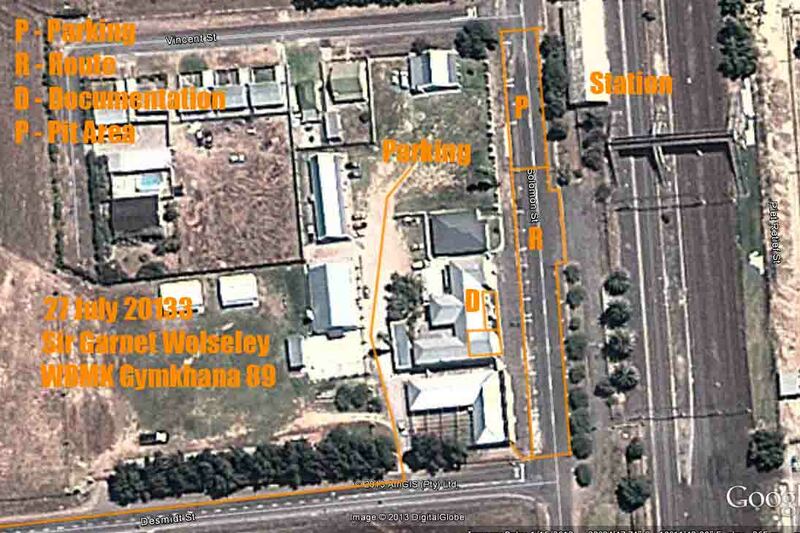 Johann Zulch and Tania Vermaak also back for more in their Ceres Toyota supported class E BMW 325im and though they might find the route limiting for the big Beemer they will undoubtedly give their best in front of the historic 1930 Sir Garnett Wolseley Hotel. Come and enjoy the day with us and expect a surprise result. Many moons ago we held some very enjoyable events around this historic Hotel in Wolseley and it will be a pleasure to return to thsi venue. Will attempt to dig up an old picture or two. I remember competing here with Neville Young in his (now restored) Nissan Skyline 2.8GTX. For fourteen years, or 88 events, the Witzenberg Motorklub Gymkhana Series have been an exclusively male dominated domain. Though this was never said in as many words they were quite proud of this fact. Though there were a few scares in the past it seemed that the threat would never become reality, that is, until Saturday 27 July 2013.